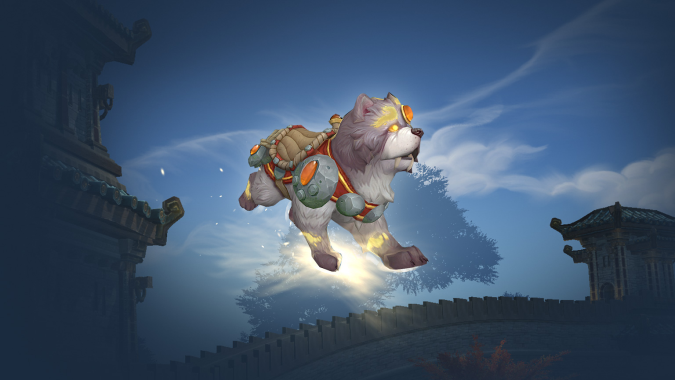 A while back, Wowhead noticed a “dog mount” in the World of Warcraft game files, but the specifics surrounding it were encrypted and left a mystery. This past weekend, however, that changed — we were given our first look at the mount’s model, as well as information on how to obtain it. Namely, it was listed as a store mount, but one that was purchasable on Chinese servers as part of a specific promotion. Thankfully, the mount has now been made available on the Blizzard Store for purchase on NA and EU realms! As you might expect, the mount costs $25 USD and will be available immediately upon purchase — better yet, it’s capable of flying! What a good pup Shu-zen is. A store mount whose description mentions Old Gods being released right before an expansion? Taken alongside the fact that Blizzard tends to tease upcoming expansion models or themes with some of its store items, it’s hard not to wonder what — if anything — this means for Battle for Azeroth. I suppose we’ll have to wait and find out, but it definitely has my curiosity piqued. What say you, readers? Will you be getting Shu-zen? On a scale of 1 to 10, is Shu-zen a 12 or a 13? Oh, and what the heck does that bit about the Old Gods mean?